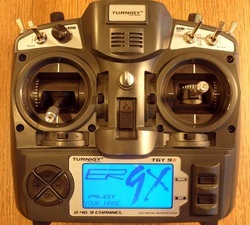 Have a broken or defective Turnigy 9X or 9XR? I can repair and upgrade your radio with Popular Mods like ER9X! These are amazing radios, but they occasionally develop problems with pots or switches, or perhaps you've dropped one and damaged it, or "bricked" it during a firmware upgrade. People started asking me regularly about repairs so I decided to start offering a repair service. Instead of throwing your old radio out, or trying to ship it back to China for repair/replacement (which will cost as much as the radio is worth - and if you've already modified it, your warranty is already void anyway), I am offering a repair/upgrade service. Please note that this is not a warranty service, and I am in no way associated with HobbyKing. I just have the parts and the know-how to do the job and want to help. Contact me with questions, and find out how I can fix and/or upgrade your broken radio today!